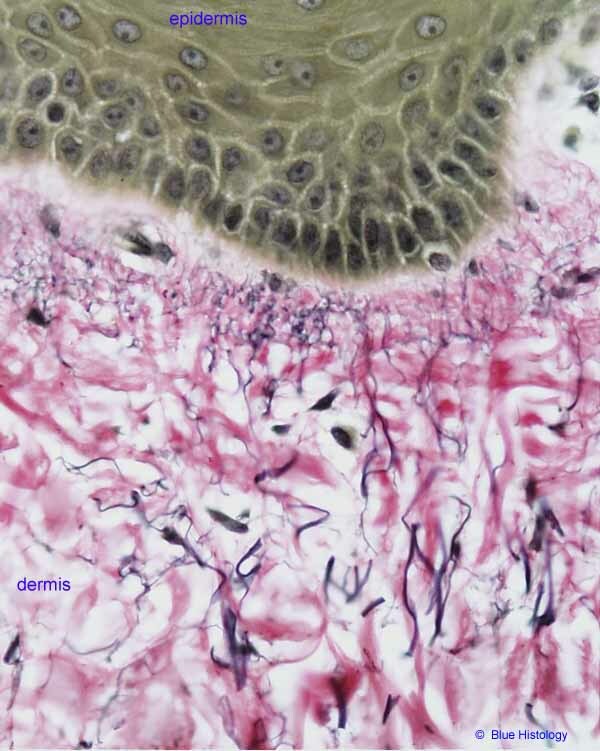 This specimen emphasizes the fibrous connective tissue that comprises the dermis, with collagen fibers stained red while elastic fibers are black. Although the difference between the finely-textured fibers of the papillary layer (close to the epidermis) and the coarser fibers of the reticular layer (lower half of the image) can be fairly distinct, as shown here, the boundary between these two dermal "layers" is fairly arbitrary. (The closely packed grey/brown cells at the top are keratinocytes, epithelial cells of the epidermis.